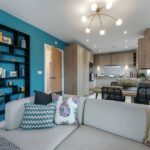 Yorkshire housebuilder Avant Homes has launched of a range of new starter homes and apartments at its Sorby Village development in Sheffield. Sorby Village is the first Avant Homes development in Yorkshire to include the brand-new range of new starter properties which, the company believes, will bridge the gap in the supply of high-quality homes in the region at an attainable price. It is also the first Avant Homes development in Sheffield to offer a collection of apartments. The new collection of homes is part of the homebuilder’s new Bridge range, which has been specifically designed to bridge the gap in the housing market for aspirational and attainable homes. These new homes sit alongside the homebuilder’s Original range of houses, offering a broad collection of properties in different sizes, designs and prices. Avant Homes Yorkshire Sales and Marketing Director, Alison Taylor-Shaw, said: “The homes at Sorby Village are great examples of our innovative design and superior interiors and have been built with our customers’ wants and needs in mind. Located on Highfield Lane in Waverley, the Sorby Village development comprises a range of two-, three- and four-bedroom homes.